The effects of your Employees are cumulative. If you have multiple engineers, for example, it is possible to get multiple extra pieces when you perform the Manufacture Equipment action. You can choose not to use your Employees' effects or to only use them partially. When you take this card (as part of the Hire Employee action), you must pay a surcharge of 1 guilder. If you don't have the money, you must hire a different Employee. Whenever you Manufacture Equipment , your engineer allows you to take an extra piece of Equipment, as specified by the card. Example: Suppose you have two engineers, +1 crane and +1 sail, and the Manufacture Equipment marker is on the cannon. When you Manufacture Equipment, you move the marker to the smokestack. This means you can get a smokestack, a crane, and a sail for free. If you pay 1 guilder, you can move the marker to the crane and get two cranes and one sail. When you take this card, you must pay a surcharge of 1 guilder. If you don't have the money, you must hire a different Employee. Whenever you Recruit Crew ), your recruiter allows you to take an extra crew member (or propeller) as specified by the card. A trader allows you to sell the specified commodity at a higher price when you Exchange Commodities. Each commodity has two levels of trader. You cannot hire the higher- level trader unless you already have the lower-level trader for that commodity. Their effects are cumulative. Example: You cannot hire the Steel: level 2 trader unless you have the Steel: level 1 trader. If you have the Steel: level 1 trader, you get 1 extra guilder each time you sell steel at the Exchange. If you have the Steel: level 1 and the Steel: level 2 traders, you get 2 extra guilders for steel. A trader also gets you bonus points . These points are scored at the end of the game. 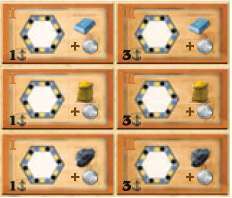 A builder allows you to put extra Crew or Equipment on a ship without needing a cabin or mounting point. Except in the case of the propeller, the builder allows you to add up to 2 of the specified piece. (You can only add 1 propeller). 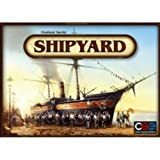 The extra pieces you add to your ship come from your Shipyard, not from the bank. Note: The +1 propeller builder makes it possible to have up to two propellers on one ship: one attached to the proper mounting point and one attached by the builder. Your completed ships get a +1 bonus to speed. Your completed ships get a +1 bonus to speed for every pair of sails. Compute speed in the normal way; then add this bonus. Note: You do not have to use this bonus for every pair of sails. 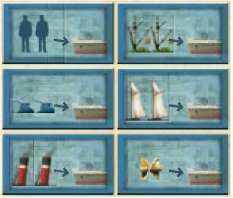 For example, if your ship has 4 sails, you can use the rigger to give you a +2 bonus, a +1 bonus, or no bonus at all. (You might not want the full bonus if your canal system is too short). When moving the marker for Manufacture Equipment or Recruit Crew, you can move it 1 or 2 extra spaces for free. (So three of the choices cost nothing, and the fourth only costs you 1 guilder instead of 3). When moving the marker for the Hire Employee action, you can move it up to 3 extra spaces for free.